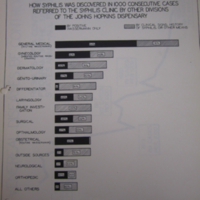 "Importance of the Blood Test as Part of the Patient Examination"
"How syphilis was discovered in 1000 consecutive cases referred to the syphilis clinic by other divisions of the Johns Hopkins Dispensary : Data from Albert Keidel, M.D., Archives of Dermotology and Syphilology, Vol. 25, p. 470, 1932." "A bit of blood is carefully drawn from the arm for the blood test. 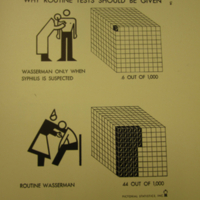 It's as simple as a smallpox vaccination." 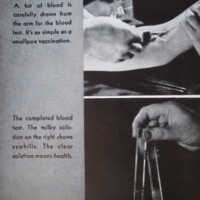 "The completed blood test. 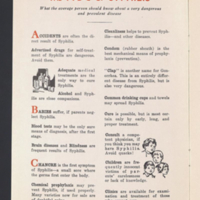 The milky solution on the right shows syphilis. THe clear solution means health." 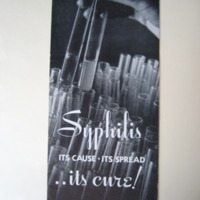 Cover of a educational pamphlet by the USPHS on syphilis.